A facial is the most popular type of non-surgical skin enhancement and is designed to make you look and feel more radiant, rejuvenated and youthful. Your skin gets exposed to the elements and pollution on a daily basis, and the sun slightly less often. With busy lives it can be tricky to give your skin as much attention as ideal. Facials involve a series of beauty treatments which aim to restore a healthy, clear complexion and balance to your skin, leaving it soft and fresh looking and you feeling pampered and relaxed. A salon or spa facial includes much more than the basic cleanse, tone and moisturise routine. Treatments vary by skin type and what you want to achieve. Using steam to open up the pores to allow extraction, a scrub or peel to remove dead skin cells, massages to relax, drain toxins and stimulate circulation, and the application of a mask to firm, rehydrate or brighten, are typical. If you’re a serious glow-getter your facial might use high tech as well as hands-on treatments to give your skin a boost. Skincare is both an art and a science. The range of products and brands can be daunting, and then there are treatments. A good beauty therapist will guide you through the options and ask about your skin condition, any problem areas and lifestyle before making a recommendation. You’ll need around 30 minutes for a mini-facial and up to two hours for the whole shebang. Some results will be visible immediately and others after a couple of sessions. A regular facial can be part of your flawless skin artillery, a pick-up before a special occasion or something you have when experiencing a breakout, tired or run-down, or in need of a treat. Whether you’re offered something truly bespoke, the most suitable treatment from a menu or using a specific technique or product depends on who you go to. On Treatwell there’s the lot and you can easily find the next available appointment at a salon near you. A good beauty therapist will guide you through the options and ask about your skin condition, any problem areas and lifestyle before making a recommendation. With so many types of facials to choose from and costing upwards of £1 a minute it pays to do your homework before booking. Knowing your skin type and deciding what you most want to achieve makes it easier to pick a treatment. 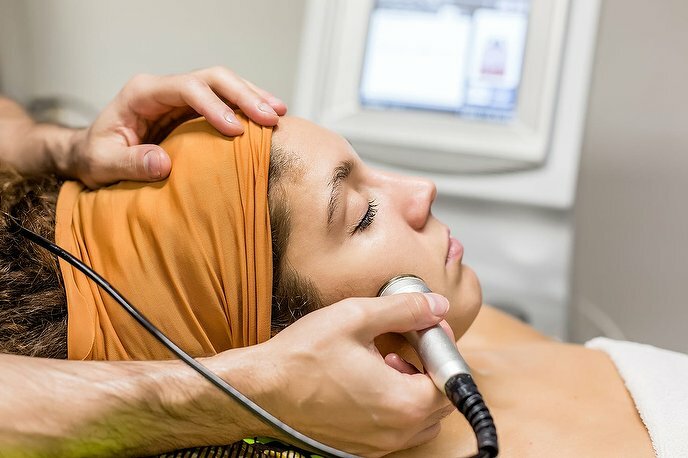 A consultation with a beautician is also helpful so that they can assess what’s going on with your skin that day and use the products and techniques that will benefit your skin the most. Your skin type depends on its water and oil content, and changes with age and the seasons. Its condition is affected by your diet, stress-level, smoking, and how much water you drink. It’s helpful to know your skin type, not just when choosing a facial. The wrong beauty regime or overuse of products can strip your skin of essential nutrients and its natural defences. Skin can become aggravated causing blemishes and spots, with fine lines and a dull or dry appearance making it look older than it is. Skin looks radiant when it reflects light evenly from a smooth surface, with few imperfections and pores barely visible. Products don’t cause any irritation and the texture is neither dry nor oily. If only most of us had ‘normal’ skin most of the time beauticians would be out of a job and cosmetic companies would fold! Facials can be tailored for sensitive or mature skin, oil- and dryness and those which have both in different areas (a.k.a. ‘combination’) as well as to treat specific conditions such as acne, puffiness and sagging. Magic ingredients such as AHA (Alpha Hydroxy Acid), Vitamin C, and Oxygen, and techniques like red LED light therapy, Microdermabrasion and Galvanic currents are just a handful of the many extras which can be used. Out, darn spot! Acne can be one of the toughest beauty bothers to treat. Depending on the type and severity of your acne, there are a range of solutions to tackle it once and for all.